Christians have long believed that a central element to biblical faith is understanding the nature of prophecy. There are a couple of kinds of prophetic activity in the Bible. One is less known and harder to understand: the phenomenon of typology. This is were there is a person, event, or institution found in the Old Testament that serves as a pattern (type) for persons, events, or institutions in the New Testament and therefore in the church. Typology has been widely misunderstood and misused in the history of biblical interpretation, so much so that it is discredited and avoided by many scholars. But there are passages in the New Testament that are impossible to understand without an appreciation of typology. For example, 1 Corinthians 10 shows Paul using typology to take events from the history of Israel as lessons for his wayward Corinthian readers. Paul is even able to point to the miraculous provision of water and manna in the wilderness as foreshadowing the elements of the Lord’s Supper. The second, more well known prophetic method is prophecy leading to fulfillment. In this view, predictions of specific things are given by the prophets of the Old Testament, and these are fulfilled (actualized) in the New Testament. For example, Isaiah foresees a pregnant virgin woman giving birth to a son who will be the Messiah. Matthew understands this as a prediction of what took place with Mary in regard to the birth of Jesus. For Matthew, this is a “sign,” a testimony that Jesus truly was the Messiah, although later theologians twisted this to be way for Jesus to escape the curse of Original Sin (something neither Isaiah nor Matthew envisaged). And its fall will cause worldwide panic. If I could prove this was written in 2006, it would seem to be a remarkable prophecy, for Lehman Brothers was flying high then, and no one expected this bank to fail and trigger the recession of 2008. But that is not the case. I just wrote that “prophecy” this morning, vaticinium ex eventu. Many years ago, I heard Mildred Welshimer Philips speak of her father, P. H. Welshimer. (BTW: his first name was “Pearl,” which explains the initials.) In the first decades of the twentieth century, Welshimer was the minister of the First Christian Church of Canton, Ohio. At its height, this was often recognized as the largest church in the world, with a Sunday School attendance of 6,000 each Sunday. 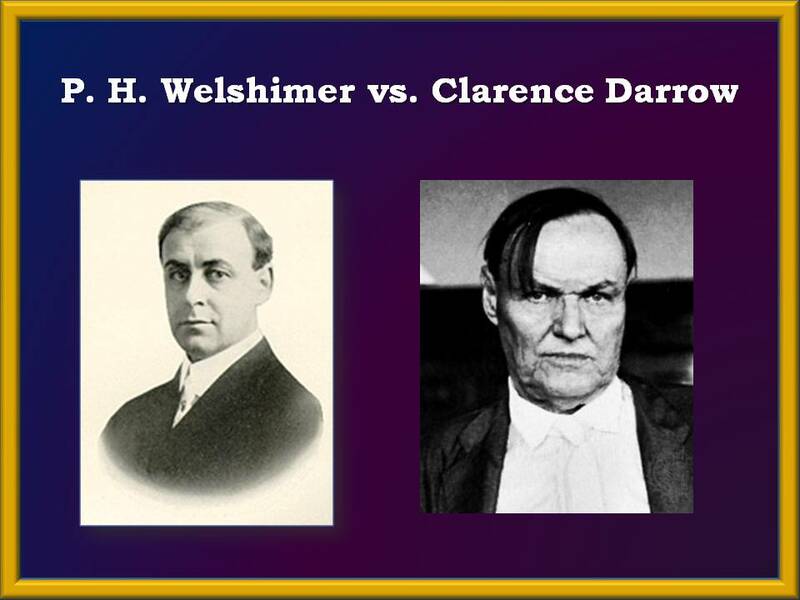 One of Welshimer’s more audacious public acts was to stage a debate with Clarence Darrow, the attorney who had won national recognition as the defender of evolution in the Scopes Monkey trial. Darrow was seen as the spokesman of a new kind of person in America, a public figure who was openly agnostic/atheist and who saw the Bible as nonsense, the church as a medieval relic, and Christian faith as preposterous. The debate was inconclusive, as most of these sorts of things are, with Darrow rarely engaging the arguments of Welshimer. But, remarkably, the two became friendly, and after it was over, Darrow confessed that Welshimer presented one argument about the Bible that gave him pause: its record of prophecy and fulfillment. It should still give us pause today, I think. The fulfillment of prophecy in the Bible is one of the strongest arguments for its authority and reliability.